What might be holding you back…. I have been fortunate enough to conduct a concentrated block of submerged filming recently of nearly 40 swimmers. When this happens patterns are easier to spot and it was easy to see how few managed to set a good arm position to assist propulsion when breathing. It really is a tough one to break unless you have had years of swim training as a youngster. Usually the arm pushes down to assist a lifting motion in order to help the head come up for air. A survival instinct no less, so it is logical and instinctive. For long distance FC this is not ideal as it strains the shoulder, impacts the neck, limits forward propulsion and as we know from a see saw, if one side goes up, the opposite end generally goes down. If the arm sweeps wide to stabilise the head position as it lifts, we often see a wide kick created to help counter balance the off balance body position. Any excess in exposed surface area will increase your drag and slow you, make you work harder and need more air/energy. 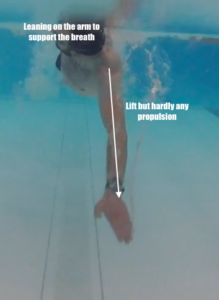 A good swimming position would be to pivot at the elbow, turning it out keeping the hand quite central and turn the forearm to vertical early enhancing the surface area of the hand. You don’t just pull with the hand, use your vertical forearm. The fingertip to elbow position is now in a place it can be of help i.e. 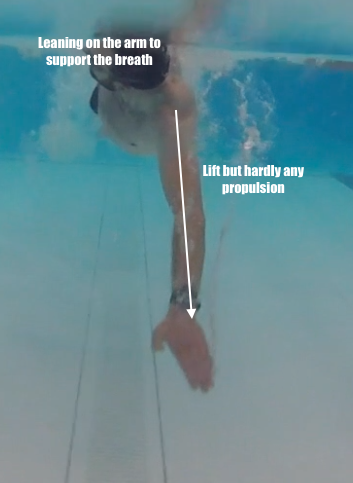 pushing water back towards the feet and not down to the bottom of the pool. Most can create this ‘ideal’ position when the head is in neutral i.e. not breathing. I try to create the same angles and positions through my arms regardless of whether or not I am turning to breathe. Imagine wasting the ability to go forwards each time you breathed!! You are literally swimming single armed. Not easy when you tire and the kick, hip involvement and rotation start to suffer. At this point the window of opportunity to breathe narrows so we need to prop it up with the arm push down. 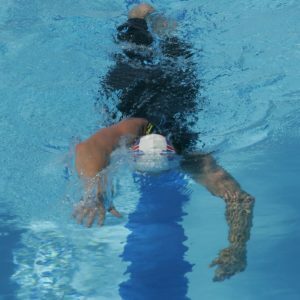 So the straight arm push down is guilty of keeping the front of the stroke up and the legs low, straining the shoulders&neck and at the least not pulling you forwards. Think about why this is important. Swimming can be described as how the hand holds water, anchoring in position, which should allow a streamlined body to pass over it without moving or slipping. Look at the relationship of the hand to the light on the side of the pool. Since we are in water we often forget how we actually travel in the water moving over quite stationary arms. It is like the difference between running on a treadmill and running on a road, we should swim similar in principle to how we run on the road. Plant the foot and the body should go fwds. Leave air around the hand and we lose ‘hold’ so the hand slips under the body with no reward of going forwards. Push down and we don’t go forwards only upwards. Lead with the elbow, keep the forearm horizontal and again the arm can slip under the body with little forwards momentum. 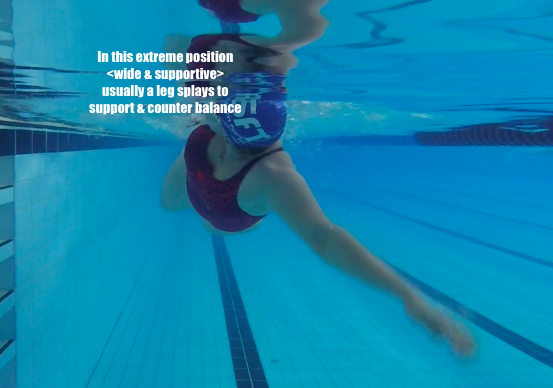 Adding a central snorkel will be a great help as a first step towards breaking this habit as the head is kept still and better arm pathways can be worked on. Learning to breathe to both sides will also be a major step forwards towards interrupting the stranglehold this bad habit has on your stroke. Switching breathing patterns too bilateral is a great step towards improving your symmetry. You do not have to breathe every 3rd stroke for this to work and on race day you might be working too hard to sustain this. In training, an easier option might be too try 2 breaths to the left then take 3 strokes to take you across to 2 breaths to the right would be enough to break the dominant habit of breathing to one side which encourages the straight arm push down. Attack this issue from all sides for best impact, snorkel, mixed breathing patterns, drills and improvements to rotation in an attempt to stop swimming single armed! 2017 the year of LAZY TRI COACHING – look out for this new trend possibly in 2017. Hopefully it is just the January headlines on FB etc as people want to help kick start your season. Tri coaches that can’t swim coach particularly well are being devious with advertising headlines on FB etc offering the Holy Grail i.e. we have discovered how you can improve with less swim training. Well you will never get better at swimming without a healthy investment in swim training. What is the one skill most of us acquired to a reasonable level as and only as adults? Driving. Many passed within 8-10 lessons, some longer. How long was it until you instinctively knew exactly where the controls were without looking? without thinking? suddenly you became a better driver once you had more time to fully concentrate on the road rather then trying to find the driving controls. Swimming is a life long skill that can be improved upon at any level but there are few shortcuts and it is definitely a journey never a destination. I was asked recently how much I might improve during a swim camp week. Hard to say and we have had some amazing results so I would say yes you will improve. How much depends on many factors but the important thing is how determined you are to maintain this and continue to work on your own post camp. Tired for the Bike – Exponential fatigue as you spend more time moving against water at near1000 times denser then air compared to biking through air. I have seen some really tired people stagger into T1. No useful swim fitness acquired which we have proved is a highly beneficial type of fitness for the other disciplines, especially if an injury prevents run or bike training for a while. Limited alternatives, ie one less discipline available if you are injured in an attempt to stay fit. Exiting low down the field and starting your bike with tired, clumsy athletes struggling to stay upright. More accidents happen at the exit of T1 than anywhere else in my opinion and I have watched a lot of Tri’s! Adding time and allowing competitors to get further ahead. Your £7k TT bike still sitting in Transition at 2hrs as I witnessed at the Outlaw is not going to catch up 45mins over your competitors. Few are going to bike at 40mph for the next 5hrs. No one does no matter how Uberbiker you think you are. Swim fitness is highly beneficial to the other disciplines as we know 6weeks of structured swim can lead to 13% VO2 max improvement. You don’t actually have to swim that fast in a Tri, just start steady and not slow down too dramatically given the long distance nature of even the ‘short’ events. Correction of some basic faults should be 10s of minutes quicker over a few Km. I am fond of saying how learning to swim faster is more like a language or learning a musical instrument. I stand by that. Timing, rhythm, confidence, coordination are all needed. Yes most can get by and that will suffice for many but how far on this journey do you want to take your swimming? Don’t give up on it. Don’t just pass your test, go further on the journey. Some have asked for a handy central location from which to access the many articles and videos we have produced. Since the shift to a new website took away our video gallery temporarily I hope this helps in the meantime. Getting over a ‘bad’ session. If you have taken a week or more out of the water over the holidays this first session back is going to feel clumsy. No swimmer at any level is going to feel great jumping back in. The water will make you feel uncomfortable and what is worse the mind will play tricks on you exaggerating how bad it all feels. We ran some experiments last year and filmed a lot of the JAN week 1 one2one lessons and showed the swimmers the footage. Most were surprised it was not as bad as they imagined. Be positive, swim a few shorter sessions, work on some drills before worrying about fitness. You will not have lost much if anything <if you kept up your bike and run.> I would take off those watches, don’t worry about distance or times just enjoy some relaxed easy swimming to shake out the cobwebs. Run through this sequence with fins or just attempt a few of the drills movements off each wall for 10m or so before resuming full stroke FC for the rest of the length. Aim for 2-3 x 30min sessions to reacquire the feel of the water. Just keep an open mind about how bad it all feels, the mind wants you back on the sofa resting and still in Xmas mode, trust me it will not be as bad as you imagine! Enjoy.